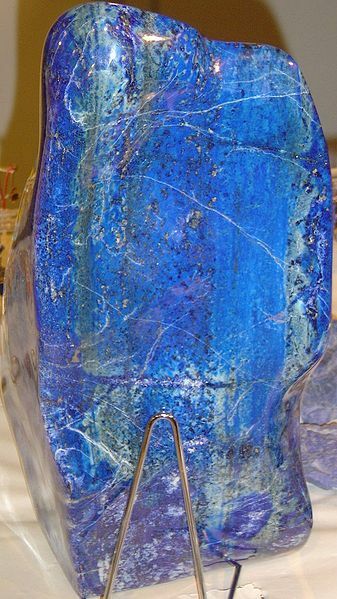 Lapis Lazuli (photo from Wikipedia). The formula is (approximately): (Na,Ca)8(AlSiO4)6(S,SO4,Cl)1-2, which sounds a bit of a challenge! 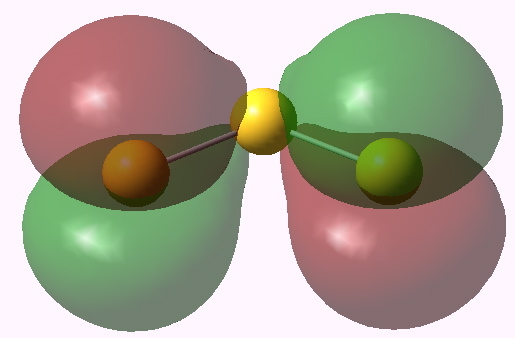 But, as a very recent article points out the component that imparts the colour is the sulfur, more specifically present in the stone as the S3– radical anion. No recent calculation of the UV/Vis spectrum of this simple triatomic has been reported, so here goes. A ωB97XD/aug-cc-pVQZ calculation, embedded in a continuum solvent field of water (which serves to compactify the otherwise diffuse anionic aspect) and with TD-DFT applied, shows the following (you will need an SVG enabled Web browser to see the spectrum. I am here promoting the use of this graphical standard, which differs from normal images in scaling as you resize the page size with no loss of resolution). The λmax is ~650nm calculated and ~619nm measured (as a solution in an ionic liquid). Not bad agreement! 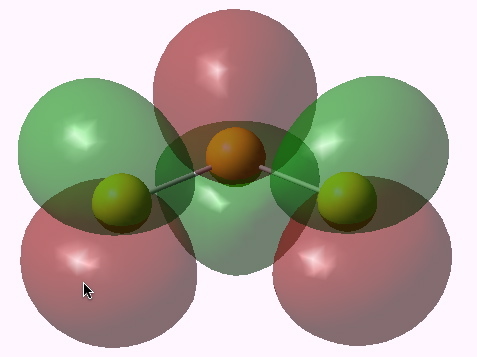 The molecular orbitals involved in the excitation are shown below. Highest doubly occupied MO. Click for 3D. Lowest singly occupied MO. Click for 3D. Such a precious colour, and produced using such a cheap material! This entry was posted on Saturday, March 5th, 2011 at 8:25 am and is filed under Interesting chemistry. You can follow any responses to this entry through the RSS 2.0 feed. You can leave a response, or trackback from your own site. One of the advantages of calculating colour is that (once calibrated) you can predict similar systems. So for example the closely related Se3–, attached here. λmax ~860nm. What colour is that?